This are the notes I have taken while setting up my Eclipse environment to run a Smartweb application. Feel free to comment! The first thing to do is to check out the existing codebase in your Eclipse workspace as a starting point. The Core of the Smartweb framework. The test library used throughout the whole Smartweb application. A project template which can be used as a startup point in a project. The first thing to do is to import the different modules that you are likely to use during your project. To do this, go into File > Import… > Existing Projects into Workspace. Select the smartweb folder in your workspace; all the subprojects should appear as projects. 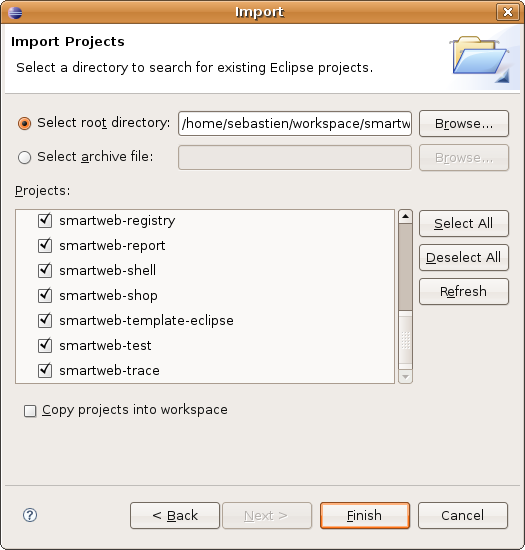 Click Finish and the projects get imported into Eclipse. Import that new project into Eclipse as previously, and you're ready to go! Create the project with a Maven Archetype. Obviously, you have to make sure that the Smartweb libraries have been installed into your local Maven repository. - Import myproject into the Web Development perspective as a Struts project. - Copy smartweb.jar.hcf into src/main/resources/META-INF (same story as above). welcome.message=To get started on your own application, edit the skeleton configuration files as needed, build with "mvn install", and you are on your way! - Run mvn package in the "auth" module folder; this creates the etc/sql/mysql.sql file to execute. Create the database schema in MySQL by executing these queries. - Open src/main/resources/META-INF/smartweb.jar.hcf and edit the parameters to use your local MySQL database. - mvn install, then Publish into your WTP Tomcat Server. Start. You should get a login page. - Insert a user in the user table. and you should get the Smartweb welcome page. to acommodate the fact that URL is not comparable. to be consistent with auth, but also to avoid to have to copy Struts TLD in the projects. - Create standalone message.properties as indicated above. org.apache.jasper.JasperException: /index.jsp(3,0) /context.jsp(3,6) /auth/login.jsp(4,65) The prefix html specified in this tag directive has been previously used by an action in file /header.jsp line 52. I removed the taglib definitions from login.jsp in auth, and moved them to base.jsp (core). I then deleted the existing Struts taglib definitions in base.jsp. I also removed DTD declaration and html:html tag, as this is a JSP fragment included in another JSP (and it was breaking XHTML std). - security.png is nowhere to be found.